BBG’s new Visitor Center is undoubtedly captivating from the outside, but inside, both new and longtime visitors will find much more than just a beautiful building. State-of-the-art exhibits as well as orientation and educational tools will help visitors of all ages and levels of horticultural expertise appreciate the rich diversity, history, and multifaceted beauty of the Garden. “Taking the time to really stop and notice the details around us is something we often forget to do as adults,” says Sonal Bhatt, BBG’s director of Interpretation. “Many of the exhibits in the new Visitor Center will remind people what to look for, what to slow down for, and what to take notice of. Inspiring a childlike sense of discovery will immensely enhance visitors’ enjoyment of the Garden.” In collaboration with award-winning exhibit designers Thinc Design and other consultants, BBG has created videos, interactive exhibits, a multimedia map with animated seasonal highlights, and even a plant ID game that will engage visitors’ senses while addressing often-overlooked key interpretive points. Alison Weeks was the Assistant Director of Membership at BBG. 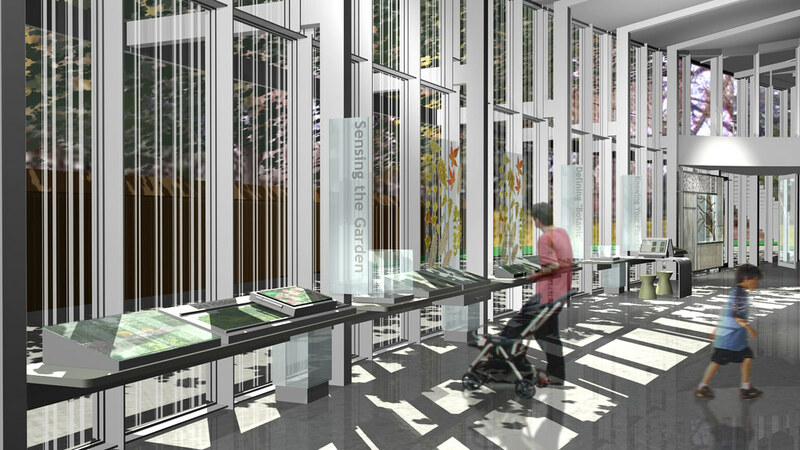 A concept sketch of interpretation consoles in BBG's new Visitor Center.